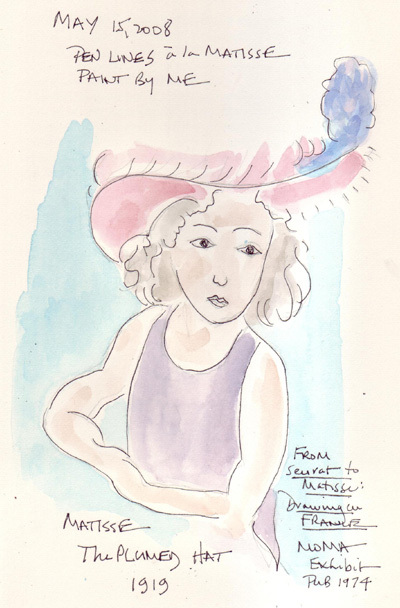 May 15th: Last week I bought a book entitled Seurat to Matisse: Drawing in France at the Strand book store in Manhattan. It was an exhibit book published by MoMA in 1974 and part of a big batch of unsold books that now were for sale and just being shelved. It was $3.95 in 1974 and $0.48 for me! I love sketching from Master drawings and just did my first one from this book. 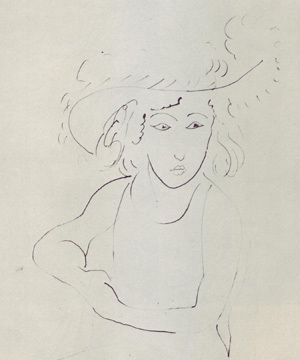 Matisse did a very simple line drawing - I added watercolor washes. Here is another recent drawing that I did from Egon Schiele's painting of his sister Gertie. The styles are so very different and yet I had fun doing both of them. 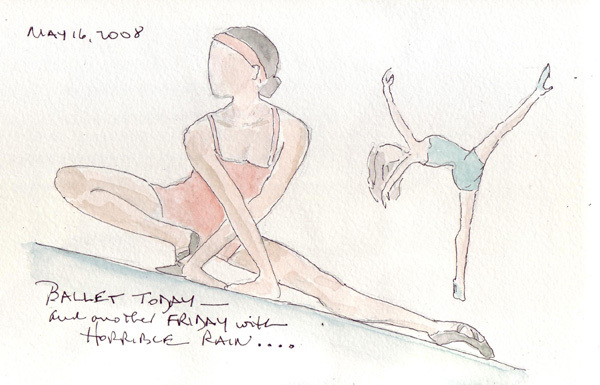 May 16th: Another ballet class and another in my series of dancers. After class I pick up post-card advertisements for upcoming performances from the ballet studio for my inspiration and quickly sketch the dancers while I have a Diet Snapple Tea and kill some time before I need to pick up my grandson at nursery school. 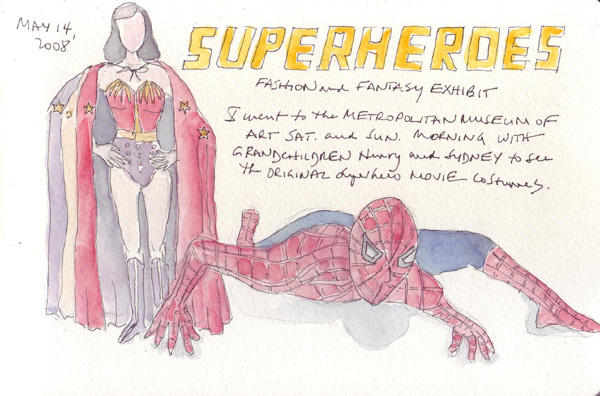 There is a new Superheroes Exhibit at the New York Metropolitan Museum of Art - part original movie costumes and part fashion from the major designers inspired by the Superheroes. My grand daughter Sydney and I saw it Saturday morning when we went to play with the Museum computers in the Education Center and she loved Clark Kent who morphed into Superman - and then back to Clark Kent, so we had to go back with brother Henry the next morning. They were so cute - such little people in that big Museum. All of my grandchildren learned how to walk better in the Temple of Dendur and regularly throw pennies into the pools there and the fountain in the new Greek and Roman Galleries. This is one of the easiest and most enjoyable ways to spend time with them when they are staying with us during really cold or awful weather in the city. I moved from my second childhood home to a college dormitory. This is the 3rd in my "My Homes" series. I lived in this specific dormitory for two years, an adjacent identical dorm in the same quad for one year, and then up on the hill in a modern dorm for my 4th year. We had to live in the dorms or at home and had very stringent curfews. No boys were allowed beyond the living room. When my children went to college both sexes shared bathrooms and had rooms on the same floor - quite a change. 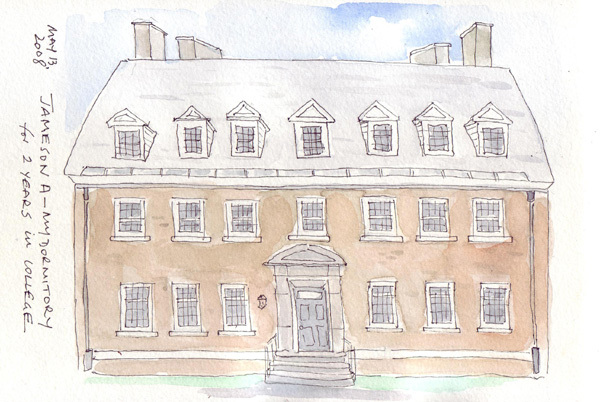 I drew the bottom of the dormitory facade before I realized that I didn't leave any room for hedges - or the tree - and my transparent watercolors couldn't possibly fix my error. Only the first floor had an interesting floor plan and I lived on the second and then third floors, so I stopped here. This is my year to practice drawing faces - and I alternate between photos and works by other artists. Yesterday was complicated - with Grandparents' Day at nursery school for 3 of my grandchildren and then work. Because of an evening program at work I didn't get home until 9PM and while watching the last episode of Medium for the year, I turned to Leonardo for inspiration. 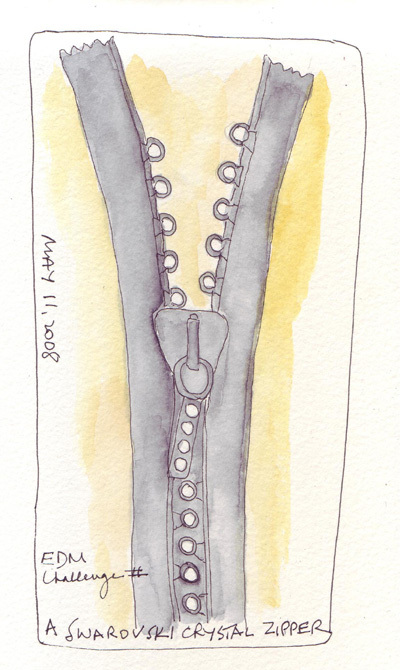 This drawing is in the Uffizi (and on my postcard!). The face is too long, but before I started sketching daily in Jan. 2006, I probably wouldn't have even tried this sketch. I am putting all figure and face sketches in my second recycled book which is dedicated to this 2008 goal. 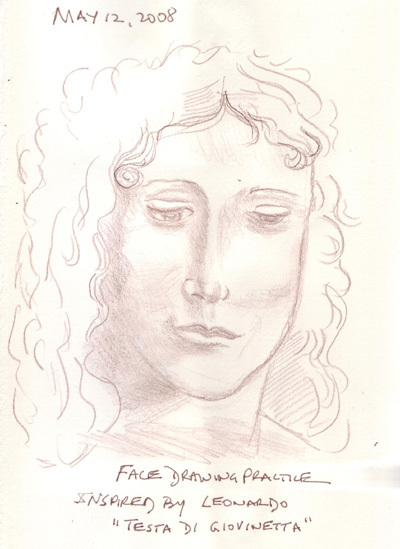 The first book for figures and faces was a recycled Michaelangelo sonnet book in which I incorporated some of the original pages of his drawings. This is a book entitled Painting Made Easy. 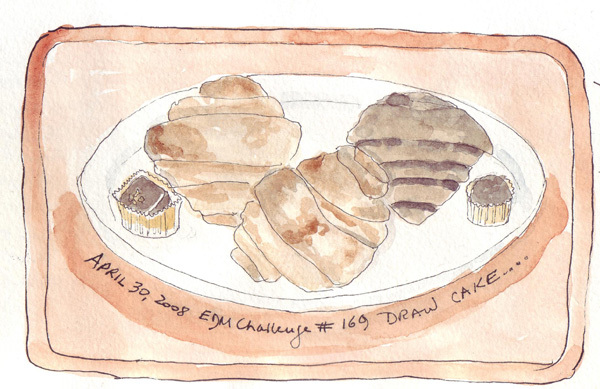 The original pages left among the watercolor paper folios don't provide the same inspiration!